Here I am, sitting at a cozy coffee house. Not just some coffee house, too, but a place where a lot of young people hang out – students, mostly. They come here for a cup of coffee much like people do at Starbucks overseas. Like me, they also come here to work – I’ve seen more MacBooks here than I did in iDeal (official Apple product distributor in Lithuania, similar to iStore / Apple Store). But I don’t have a MacBook. Perhaps that is why through the corner of my eye I notice a young girl looking my way. Now, my Julie has no reason to worry. The girl is not interested in me whatsoever. What caught her eye is the computer on my lap. She notices me noticing her and immediately says – “What sort of computer is that? It’s pretty.” Right. So this might not help my self esteem, but the girl is indeed correct. I appreciate a good design and, well, this thing looks the part. Coupled with the bright blue keyboard, certainly good enough to attract attention. Whether you want it to attract attention or not is a different matter. More importantly, though, it’s not all looks and no substance. Quite the contrary, in fact – Microsoft’s Surface Pro 3 is ready to give someone a bloody nose. 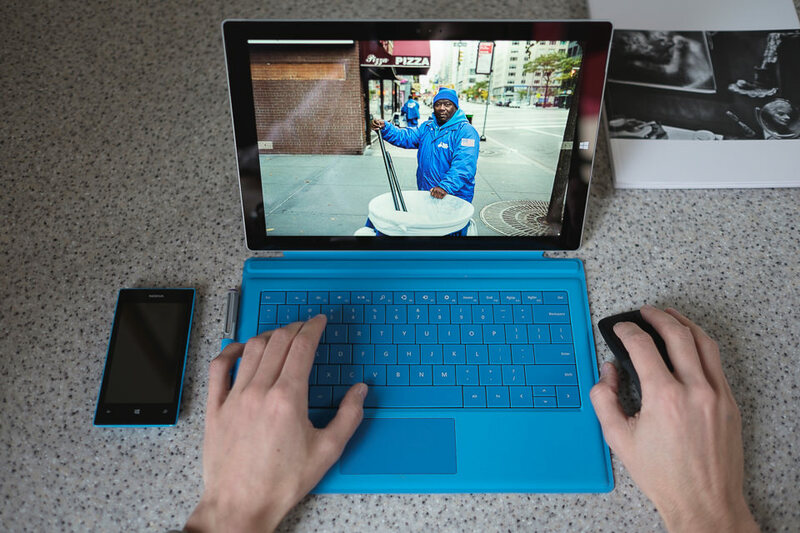 The Surface Pro 3 has, for me, the perfect dimensions. It is very similar in size to a magazine. The slightly larger-than-average for a tablet screen of 12″ diagonal (3:2 aspect ratio) is perfect for the sort of work I do on the move, but I do wish the bezels were a tiny bit thinner (and thus the screen slightly bigger still). Mind you, that is subjective, as when using the Surface as a tablet, the bezels provide comfortable space for a more secure grip. It also looks on the right side of well-proportioned (just), so no real complaints here. Disclaimer: our words are always our own. Microsoft did not provide me with this Surface Pro 3, it was bought with real money from a real store. If you find this review to be very positive, it’s not because someone paid me to write positively – it’s because Surface is that good for my purposes, period. Most of you probably do not need this explanation and if that is the case, just skip it. But for those who wonder why on Earth I am reviewing a computer on a photography website, here is the simple thing – nowadays, digital photography and computers are inseparable tools. If you have a digital camera, you must have a computer, too. If not for post-processing (I got into the habit of processing my work in-camera when shooting with the Fujifilm, I just love the tones, the colours, the general rendering so much), then for sharing. If not for sharing, then at the very least for storing the work somewhere as your memory card gets full. Me, I was very much looking for a super-portable laptop that I could occasionally process my work with, but, more importantly (as I have a PC at home that I am quite happy with), one that would be brilliant for writing on the go or showing my work to clients during meetings. I am certain that a lot of you need such a tool as well, hence the review. I won’t hide it – I think I found what I was looking for and more. This thing is incredible. But I won’t spoil it for you, keep reading! A rather extensive side note: I am going to mention Apple quite a bit in this article, and especially in the design section. Why? Simple. You may love or hate the Cupertino giant, but there is one undeniable fact about it – Apple has made some of the most beautiful pieces of consumer technology, ever. More than that, the craftsmanship is only matched by the likes of Leica, Bowers & Wilkins, Braun and such. Their products can often be considered jewelry, that’s how obsessive Apple is when it comes to attention to detail. So, comparing someone’s product to Apple in terms of design and fulfillment is sort of a big compliment, regardless if you like the company or not. Now, I am not a designer, never have been and how little the subject was touched during my studies hardly gives my words enough weight to draw any sort of serious conclusions here, so keep in mind everything I am about to say next is merely a matter of opinion. Also, I’ve owned but a few Apple products and so my opinion is in no way influenced by sentiments – in fact, I have no sentiments for the brand (although I must admit I am a big fan of the iPod Classic). If you’ve never heard of the Surface before – and I could never blame you for it even though we reviewed the Surface Pro 2 a while ago – it is basically Microsoft’s attempt at beating Apple by… doing what Apple does. Sounds strange, yes? Well, let me ask you this – when someone says “Apple”, what do you first think about? iPhone? iPad? I am betting it is either one of those or the Macs and iPods (and Steve Jobs, but that is irrelevant within the context of this article). That is because, in the eyes of the consumer, Apple is a hardware company, and a software company afterwards. In fact, the hardware and software part of the products is so integrated, so tied-up, it is hard to see it differently. It is the physical product itself that you first see and touch, and you have to consciously separate the operating system from the hardware to not see the two as one. Only Apple products run Apple operating systems, be it mobile, lightweight iOS or the more capable, full-fledged Mac OS. There are no iOS or Mac OS powered Samsung, Dell or Panasonic devices. It would be weird to see such a device. Cupertino, nothing else. Now, the second part of the question – what do you first think of when you hear someone say “Microsoft”? I am pretty certain that, for the most of you, it is either Windows or Office. If you own an Xbox, you might think of it at some point, too, but most likely not before the software. In the eyes of the consumer, Microsoft has always been a software company first and foremost and, as far as I know, they’ve never made in-house computers, at the very least not in recent years. Until a couple of years ago they introduced the first generation Surface and Surface Pro tablets. Now, when I say tablets, it is only partly true. The Surface (not the Pro) was indeed a direct rival to such devices as Android powered tablets and the iPad, but the Pro is somewhat different. Rather than utilizing a mobile OS, it ran on a full, big, solid version of Windows and as such was not only a rival to the iPad, but even more so to traditional ultrabooks and “notebook” class laptops. 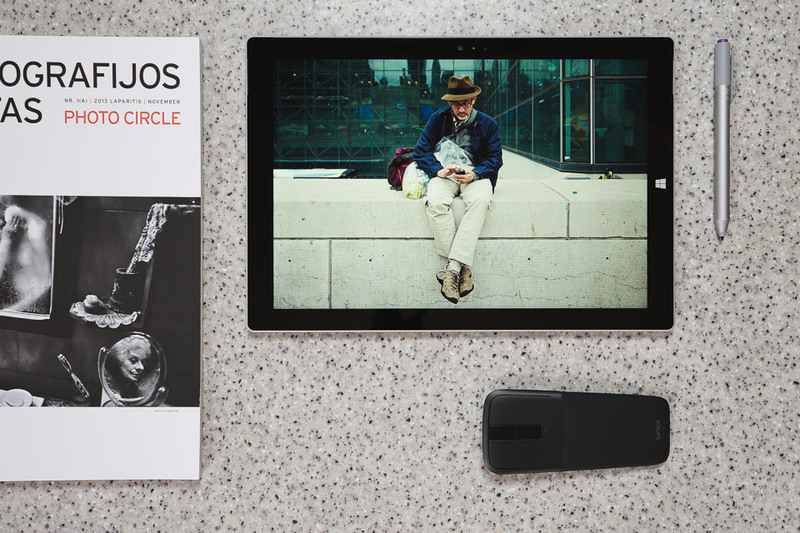 Which means Office, Lightroom, Photoshop, Bridge, Illustrator, your favourite browsers, even games – whatever you have on your PC at home, the Surface Pro has the potential to run it, and the latest version certainly makes the whole experience very smooth. As you can see, specs vary greatly, but so does the pricing. From an arguably moderate $800 (if you remember this is a premium product) to, as near as makes no difference, two thousand dollars, there is plenty of choice, but no version is cheap, nor perhaps should it be. Then again, Apple products are hardly inexpensive with base MacBook Air (both screen sizes) coming in at comparable price (they feature better specs on paper for a little bit more money, but none have a touchscreen or can be used as tablets, nor do they have such brilliant screens). There is no arguing, however, that you could purchase much more capable piece of hardware for the money, at least on paper. 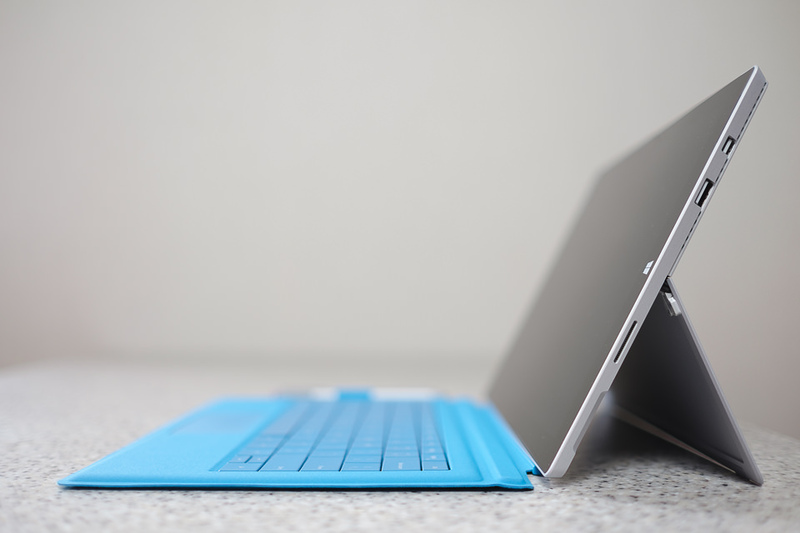 The Microsoft Surface Pro 3 is exceptionally slim and elegant. Now, considering just how compact this full-fledged computer is, the rest of the specifications are quite impressive. Neither the keyboard or mouse require, say, a USB port – the mouse connects via Bluetooth whilst the keyboard has a separate magnetic dock. Thus, a single port is not as much of a problem as it might seem if you keep in mind this is a tablet/laptop for travel. The screen is very impressive and has more resolution than my stationary 21″ Dell monitor. The microSD slot can serve as a useful memory expansion for, say, backup purposes (otherwise it is too slow). Battery life is also quite impressive, but then this is one of the main selling points (more on that later). And even though the DisplayPort requires an adapter, at least there is a way to connect a larger monitor or TV. The Surface Pen is a very nice addition, too, especially for those working with graphics and photography. And, of course, there is the obligatory 3.5mm audio jack for those who like to work whilst listening to their favorite music. Enough with the specifications, though. As impressive or otherwise they might be for a tablet/laptop of this size, they are not a reason why this is a premium product. The next bit is.